The application window for McDonald’s Progressive Young Farmer scheme is open to help students improve knowledge and insight into traceability, the supply chain and the process from farm to fork. Danusia Osiowy finds out more. Agricultural students wishing to boost their farming career are being encouraged to apply for the Progressive Young Farmer programme, run by McDonald’s. Now in its sixth year, the 12-month programme offers an insight into tracing every step of the supply chain, from farm to front counter. During the placement there is particular focus on RSPCA-assured British pork, British and Irish beef, UK milk and British potato production, and individuals are mentored by some of the progressive British farmers supplying the McDonald’s menu, as well as some of the UK’s leading food-supply companies. The programme, which pays a salary of £15,000, is designed to help young farmers develop the broad range of knowledge needed to succeed in today’s farming sector, including business skills and technological know-how. The application process to be a 2017-2018 entrant is open and will close on January 15. Applicants must be passionate about a career in farming, have some prior knowledge of farm business management and practical farming experience. They must also be in their second year of university, working towards a degree in agriculture, business studies, maths, science or geography, and be aged 18 or over. 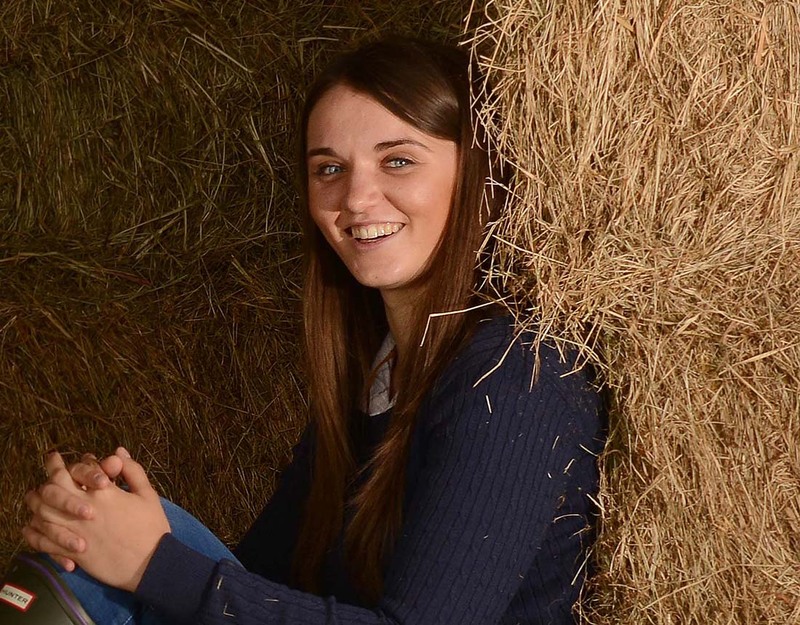 Katie Grantham has been blogging for Farmers Guardian for the last 12 months with fellow students Annie Pushman, Worcestershire, and Alice Partridge, Suffolk. We catch up with her as her placement comes to a close. When everyone else at A-level was considering courses in English, history and drama, I already knew I had to get into agriculture. Since starting my course at Harper Adams University two years ago, my interest in agriculture has increased and I’m so lucky to be a part of an industry which requires such a wide variety of skills and disciplines to be successful. I grew up in South Yorkshire, where we farm cereals, potatoes, a small flock of sheep and a Limousin cross suckler herd. I have been interested in agriculture for as long as I can remember. It’s the foundation of nearly every aspect of the human food chain and something I feel passionate about, so when the chance to be a part of the programme came up I knew it would be perfect for me. Having grown up heavily involved in beef production, I was really excited to learn my focus for the next year would be the beef supply chain. I experienced the beef supply chain and worked with beef processor ABP. They are a key supplier of forequarter and flank to OSI Food Solutions who make more than three million beef patties a day for McDonald’s restaurants from their site at Scunthorpe. Working on an ABP site in Langport, I gained a thorough understanding of how an abattoir and boning hall works. I spent time in the lairage, where I witnessed first-hand the importance of animal welfare, seeing animals assessed to ensure they are fit, healthy and unstressed. It’s important all the paperwork is checked, including the animal’s passport, as all cattle entering the McDonald’s supply chain must be sourced from farms accredited to a nationally-recognised farm assurance scheme, such as Red Tractor. As soon as the animal is unloaded, its ear tag number from the passport is scanned onto the system and this number remains with the carcase. Once the carcase enters the boning hall its individual number is allocated to a distinct batch which, on delivery to OSI Food Solutions, means each batch of forequarter and flank can be traced right back to farm. Spending time with the ABP technical team has given me an insight into the quality controls carried throughout the plant. Cleanliness is essential and training, procedures and equipment are all in place to avoid contamination. The rate of fall in the carcase pH and temperature are carefully measured for meat quality. I found the science behind chilling and preparation of carcases particularly interesting, with a number of different techniques to improve meat colour, taste, texture and tenderness. I have seen how the procurement team work hard to build relationships, improving the feedback farmers receive and how prices are calculated. ABP Langport has just started to use a new 15-point EUROP grid, allowing them to grade cattle more accurately. The entire year has been overwhelming for me. I’ve managed to learn so much in a short space of time. It has been amazing how much everyone has been willing to share their knowledge and welcome me into the industry. Previous: Where next for robotics?